In Hindu religion, Dwarka is the holy city associated with Bhagavan Sri Krishna. 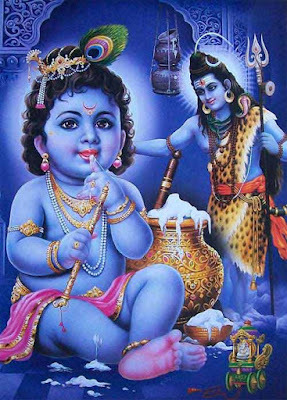 The origin of name Dwarka is associated with the Nageshwar Jyotirlinga Temple in Dwaraka and demon couple Daruka and Daruki. Daruka and Daruki lived in a dense forested area on the coast of Saurashtra in modern day Gujarat. As the demon ruled the area, it was known as Darukavana. There were several ashrams in the forest and Shiva used to give darshan to the sages here. Daruki was a great devotee of Mother Goddess Parvati. She propitiated Ma Parvati and got powerful boons. Daruki and Daruka disturbed the people of the region especially those sailed in the seas. The demon couple once captured a ship, which include Supriya an ardent Shiva devotee. To escape from the clutches of the demons, Supriya asked her fellow travelers to chant Shiva Panchakshari Mantra – Om Namah Shivaya. Shiva could not ignore the prayers of his favorite devotee and he came to her rescue. As Daruka and Daruki had the blessing of Maa Parvati, Shiva could not annihilate them. Therefore, Shiva bestowed Pashupatastra upon Supriya and she annihilated the demon couple with it. Because of the blessing of Ma Parvati, the region remained to be known after the demon couple. It was known as Darukavana and later it became Dwarka during the time of Bhagavan Sri Krishna.